The United States Sports Academy recently held its 33rd Annual Awards of Sport program on campus in Daphne. Honorees, seated from left, are Sport Artist of the Year, Sculptor, Richard Watkins of Atlanta, Ga.; Dwight D. Eisenhower Fitness Award winner Fairfax Hackley, master trainer and bodybuilder from Falls Church, Va.; Alumnus of the Year Dr. Dave Shrock of Modesto, Calif., (Ed.D, Sports Management, 2009), USA Track &amp; Field leader and Academy National Faculty member; Dr. Ernst Jokl Sports Medicine Award winner Dr. Kenneth Cameron, director of Orthopaedic Research at Keller Army Community Hospital in West Point, N.Y.; and Sport Artist of the Year, Painter, William Williams of Battle Creek, Mich. Respective presenters were trustees, second row from left, Jack Scharr of St. Louis, Mo. ; Dr. Gary Cunningham of Santa Barbara, Calif., Academy President and CEO Dr. T.J. Rosandich of Fairhope, Ala., Dr. Don Wukasch of Austin, Texas, and Susan McCollough of Gulf Shores, Ala. Shown third row from left are trustee Dr. Nick Niccolai of Mobile, Ala., and trustee and Founding President Dr. T.P. Rosandich of Daphne, Ala.
To view a full length video of the Awards of Sport 2017 ceremony, click here. The Academy’s Awards of Sport honor those who have made significant contributions to sport in categories as diverse as the artist and the athlete. The awards honor exemplary achievement in coaching, all-around athletic performance, courage, humanitarian activity, fitness, and media, among others. 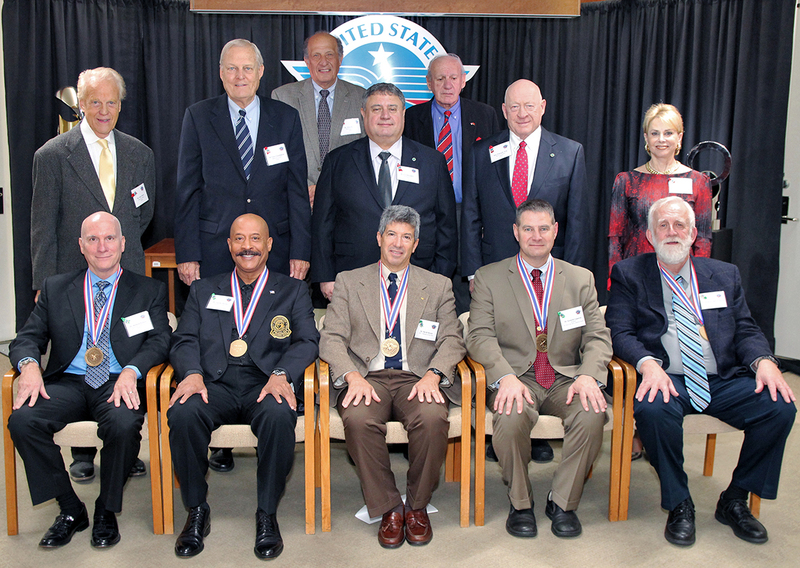 The Academy’s American Sport Art Museum and Archives (ASAMA) annually recognizes these men and women through its Sport Artist of the Year, Honorary Doctorates, Medallion Series, Distinguished Service Awards, Outstanding Athletes and Alumni of the Year awards. A highlight of the event held on the Academy’s Daphne campus was the unveiling and donation to ASAMA’s permanent art collection works by the Academy’s 2017 Sport Artists of the Year: sculptor Richard Watkins of Atlanta, Ga., and painter William Williams of Battle Creek, Mich.
Watkins’ award-winning sculptures are known for capturing the energy, dynamics and balance of amazing athletes at that single moment of intense action: the slam dunk, the long pass into the end zone, the double play. He exaggerates the physical proportions to an extreme, giving them incredible action and an engaging quality. His donation, a basketball piece entitled “Slam Dunk,” is now on display at ASAMA. Williams is nationally known for his classical artistic approach to representing the glory of sports through his realistic still life oil paintings. His work is in the permanent collections of the National Baseball Hall of Fame, the College Football Hall of Fame, the Commissioner of the National Basketball Association, the New York Yankees, and many others. His donation now on display at ASAMA is a still life entitled “Satchel’s Monarchs” which depicts artifacts related to legendary baseball player Satchel Paige. A show featuring works from both artists is now on display at ASAMA in the Dr. Thomas P. Rosandich Gallery, which is named after the Academy’s Founding President. Among other key honors at the event, Dr. Dave Shrock was named the Academy’s Alumnus of the Year. A national leader in track and field and an Academy National Faculty member, Shrock earned a Doctor of Education degree in Sports Management from the Academy in 2009. He has taught sports marketing and sports leadership for the Academy’s international sport education programs in Thailand, Bahrain and the United Arab Emirates. A resident of Modesto, Calif., Shrock serves in numerous USA Track and Field (USATF) leadership roles including president of the nation’s largest association, the Pacific Association; Coaching Committee chair; and as chair of the National Associations Committee. In 2017 the USATF presented him the McGill Legacy Coaching Award in recognition of his “passion and leadership nationally for the promotion of USATF coaching education.” Shrock has more than 40 years of track and field coaching experience, including 20 years as a college coach. His association work includes oversight of several national championships and hosting Olympic trials. Also in attendance was the winner of the Dr. Ernst Jokl Sports Medicine Award, Dr. Kenneth Cameron, who is director of Orthopaedic Research at Keller Army Community Hospital in West Point, N.Y. Cameron’s primary research interests are in the areas of injury prevention, musculoskeletal injury and disease epidemiology, and outcomes associated with the treatment of these injuries, specifically in physically active and military populations. Receiving the Dwight David Eisenhower Fitness Award at the event was master personal trainer Fairfax Hackley, who won 12 class titles in bodybuilding and later served as a judge and as director of the Mr. America contest. He spent more than 20 years in the sport, winning the International Federation of Body Building and Fitness (IFBB) Silver and Gold Awards for Excellence in Administration. He has trained numerous celebrities and athletes, including boxers and mixed martial arts (MMA) fighters. He has worked closely with the Arnold (Schwarzenegger) Sports Festival in Columbus, Ohio. The resident of Falls Church, Va., is a member of the International Sports Hall of Fame, serving on its advisory board. International Honorary Doctorate: His Excellency Ali Ben Bongo Ondimba, President, Republic of Gabon. National Honorary Doctorate: Sunil Gulati, President, U.S. Soccer Federation. Sport Artist of the Year, Painter: William Williams, Battle Creek, Mich. Sport Artist of the Year, Sculptor: Richard Watkins, Atlanta, Ga. Alumnus of the Year: Dr. Dave Shrock (Ed.D, Sports Management, 2009), USA Track & Field leader and Academy National Faculty member. Eagle Award: Dr. René Fasel, D.M.D., President, International Ice Hockey Federation; International Olympic Committee Executive Board and former Chair of the Association of International Olympic Winter Sports Federations. Amos Alonzo Stagg Coaching Award: Mike Holloway, Head Track and Field Coach, University of Florida. Carl Maddox Sports Management Award: Don Garber, Commissioner, Major League Soccer, and CEO, Soccer United Marketing. Vivian Stringer Coaching Award: Patty Gasso, Head Softball Coach, the University of Oklahoma. Dr. Ernst Jokl Sports Medicine Award: Dr. Kenneth Cameron, Director of Orthopaedic Research, Keller Army Community Hospital in West Point, N.Y.
Dwight D. Eisenhower Fitness Award: Fairfax Hackley, Master Personal Trainer and bodybuilder. Jackie Robinson Humanitarian Award: Justin James “J.J.” Watt, National Football League player and leader of Hurricane Harvey relief effort. Jim Thorpe All-Around Athlete Award: Nafissatou Thiam, World Champion heptathlete, Belgium. Juan Antonio Samaranch IOC Disabled Athlete Award: Oksana Masters, Paralympic Cyclist and World Para Nordic Skiing Champion. Mildred “Babe” Didrikson Zaharias Courage Award: Anthony Rizzo, Major League Baseball player, cancer survivor, and founder of the Anthony Rizzo Family Foundation. Ronald Reagan Media Award: Dave Finocchio, founder, former CEO and Chief Content Officer of The Bleacher Report. Theodore Roosevelt Meritorious Achievement Award: Jon Runyan, former NFL player, former U.S. Congressman, and current Vice President of Policy and Rules Administration for the NFL. The Academy’s Male and Female Athletes of the Year will be selected in January with the input of international online balloting. To view a video of the complete 2017 Awards of Sport program, go to https://www.youtube.com/watch?v=jAknCmzB29k.